On Thursday night I had the pleasure of hitting up the VIP night for Therese Rawsthorne's first ever pop-up store. The store (located at 401 Crown Street, Surry Hills) stocks an extensive range of Therese's SS11/12 collection, Falling, together with her diffusion line T.R. Ensemble. The latest collection lives up to the ethos of Therese's brand as uncontrived and easily wearable, with signature garments alongside statement pieces. I was lucky enough to have a quick chat with Therese who spoke about how the inspiration for Falling was derived from the nineties TV series, Twin Peaks. TR: It's a bit of a tribute to a lot of the characters in the show and so there's a really nice blend of masculine elements mixed back with really soft feminine pieces. With the costuming in the show they use lots of iconic styles like trench coats and biker jackets and I tried to integrate those in but reinvent them by splicing them and putting them together in new ways. The outcome is obviously my signature still, but it's really pretty and really light, as well. 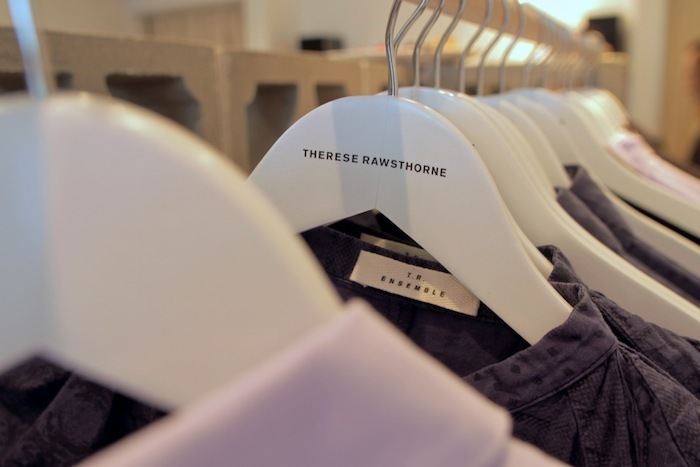 B&B: What's your favourite Therese Rawsthorne piece ever? TR: Oh, ever? (laughs) I don't know if I could pick. It's kind of like you forget about pieces after a while and then you go back into the archive and you go "oh wow, this is great!" and out it comes again. But one of my favourite pieces this season is probably the Twist Smock, it's a really beautiful Japanese cotton shirt, or the Trench Biker jacket with the leather sleeves and trench coat body. They're a couple of my faves this season but it's always hard to choose. B&B: Who are what are your biggest influences? TR: I get lots of inspiration each season from different sources like film and books and artists. Overall I guess my taste is quite broad. I really love the beautiful designers from the '20s and the '50s but I think it's always changing. For me the inspiration is more about the woman who wears the clothes rather than a specific time period or a place. B&B: So who would be one of your top style icons? TR: Probably somebody like Patti Smith. She's got a really amazing personal style. She also had that ability to throw things together, that looked really effortless but she looked really great. B&B: If you were on death row, what would your last meal be? TR: Maybe a bowl of ice-cream. Big ice-cream fan. In the meantime, I think I'll be beans-on-toast-ing it for a while so I can mother that insanely sick Trench Biker. Make sure you don't miss out - the pop-up store is only open until 17th November. Therese's latest collection is also available for those internationally here. adorable. i love pop up stores! this is so sweet !!! aww I looovw the 2nd jacket :) amazing post !! Thats so cool shop looks great! You aleady know how I feel about that beautiful leather jacket. Omg, that jacket is the most gorgeous thing ever! WOW! all are great! We love it so much! twin peaks!? sounds cool to me! naw babe thanks for such a sweet comment ^_^ you're the bestestestest! LOL. 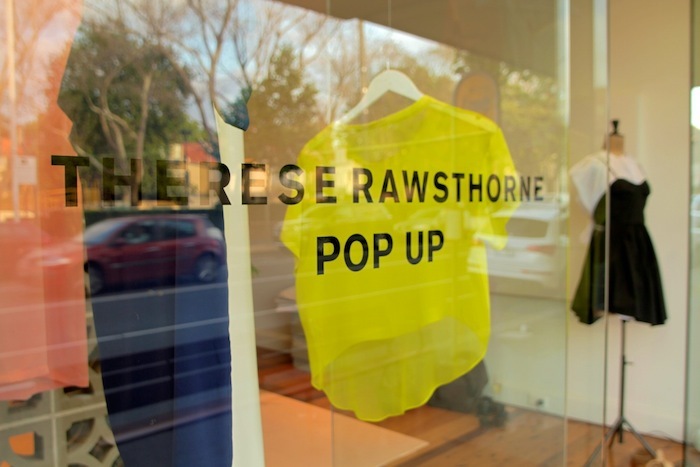 and omg I'm a huge fan of Therese Rawsthorne's stuff so I am SO jealous that you guys got a pop-up store down in Syd. Wish she came to Brisbane arghhh!!!! awesome photos babe, that jacket with the studs is actually in a photo frame on my dresser. stole it from a magazine hehe. Nice interview. Love the studs on the jacket sleeves. OMG, the studdded jacket! I want it! woooooow...what an amazing event!! lucky girl! I looooove everything in the store! if I had the moolah, I would have a field day in there! We love the jacket on the second picture..
Great interview; thanks for sharing! I really LOVED the stud jacket! Is this brand from usa? Im going to orlando next week for vocation and i was wandering if i could find something like that there, do you know? the clothes look amazing. i love the peachy colors. really fresh! Ah none of these awesome Pop Ups ever open up near me! Really wish I could get my hands on that amazing leather jacket! loving yellow right now so love that tee!! Ahh wish I was in Sydney! I love her stuff (as you may seen in my previous posts). Such a cute interview and I love that jacket! Oh Therese Rawsthorne will be the death of my bank account. love the color and style of the studded jacket! I also love what you're wearing in "the long and short of it" entry! Let's follow each other dear! that sounds exciting, and looks great! your blog is really cool, I love how easy it is to navigate. lalala. i love this store. i went in there and wanted a bunch of things but the colours just weren't quite right for my skin. sad. Love that biker jacket! I'd be 'beans-on-toast-ing' too! that mustard studded jacket is absolutely DIVINE. gah i'll join you in saving up for that, it looks amazing! I´ve never heard about this brand before, it looks amazing though. 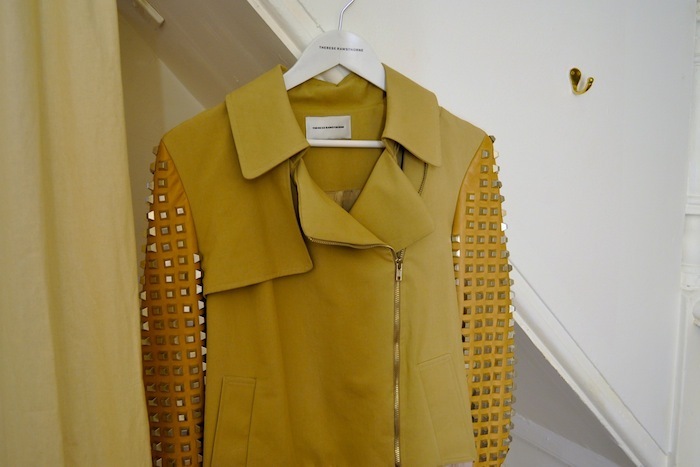 Loved the yellow jacket with studs. Love discovering new brands, especially if they are as good as this one!!!! amazing top the one on the first pic! that jacket is TO DIE FOR. Brilliant interview! And that yellow studded jacket looks INSANE. the studded leather jacket is TO DIE FOR!!! So, so cool. I adore the jacket with the studded arms. I have a new post on my blog with pictures from a mini fall RTW collection I designed. If you have a minute, stop by and tell me what you think! the jacket in that second photo...i'm drooling! i definitely love the yellow jacket!! anywy, where do you live dear? 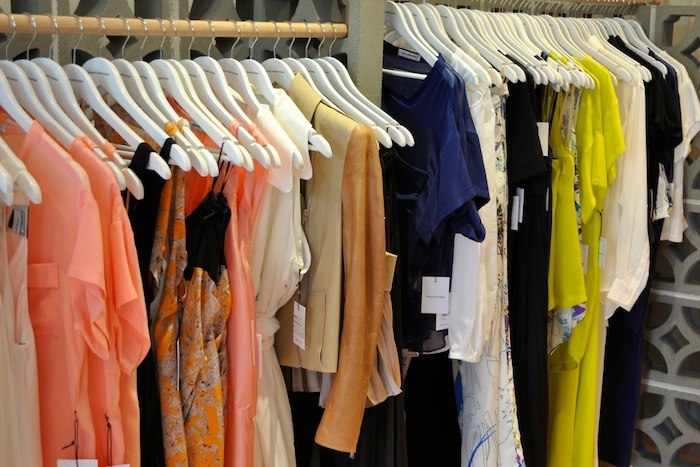 Gorgeous gorgeous clothes!! I love that studded jacket. that jacket needs to be in my life!! That studded coat is amazing! All photographs of me are taken by Nick Pes and/or Shannon Pope. All other photographs are taken by me, unless otherwise stated. If you publish any of these images elsewhere, please credit this blog.